Gen Xtinct: Blue, blue, red, gree-BLUE! I MEANT BLUE! Blue, blue, red, gree-BLUE! I MEANT BLUE! 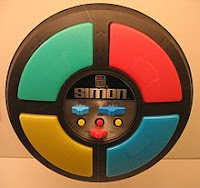 Oh, Simon. I loved you so. I suspect you gave me RSI, but you were still a favorite. Joey Lawrence is back again? Whoa. Hong Kong Phooey, number-one super guy! Classic Clip Monday: Whatsamatta you? Hey! Funky food Friday: Burple? Yes, Burple! Operator, can you help me place this call? "You can call me Ray, you can call me Jay..."